Amplify Credit Union is a leading credit union with more than 57,000 members and over $800 million dollars in assets. Amplify has been in business since 1967, operating several branches in the Austin area. 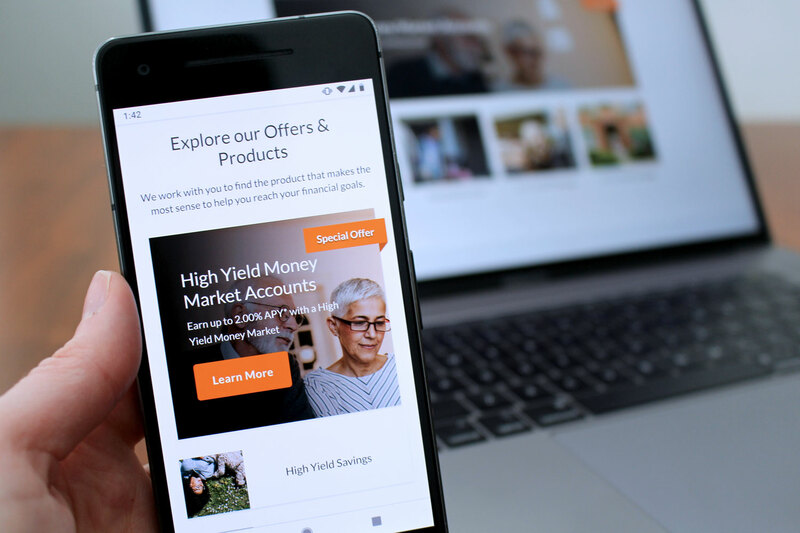 More consumers are transitioning banking solely online. 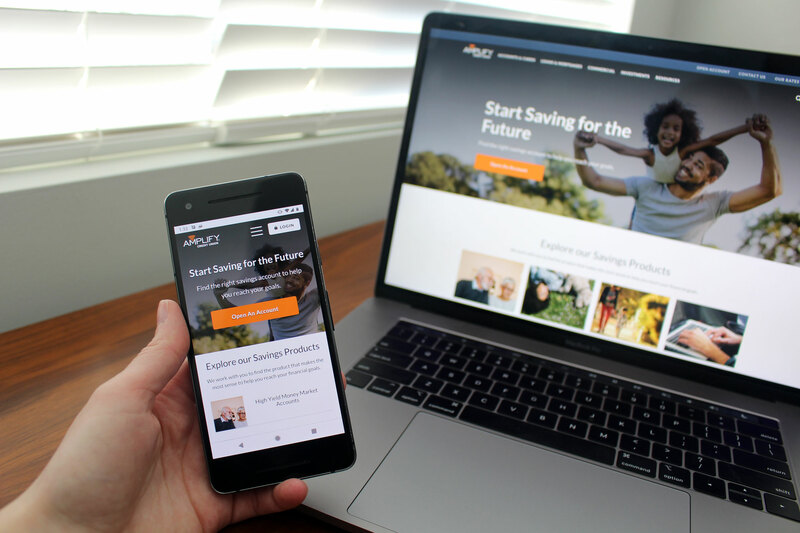 This transition makes it more important for local credit unions like Amplify to have a strong digital presence. A strong website is the starting point and hub for any companies digital experience. 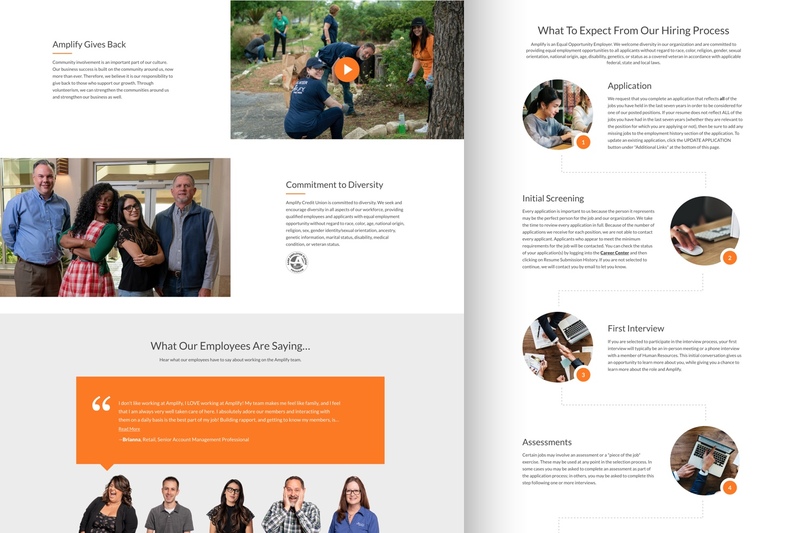 Amplify wanted to redesign its website to push ahead of the curve in visual design, user experience, and accessibility. It also wanted to ensure the underlying technology of the new website was flexible and offered excellent performance. We kicked off the project by flying out to Austin, TX to meet with the Amplify team in person. This allowed us to gain a thorough understanding of their business, goals, as well as what sets them apart from their competitors. We also brainstormed ideas for how the new website could improve their business. We started by designing multiple options for navigational structures. 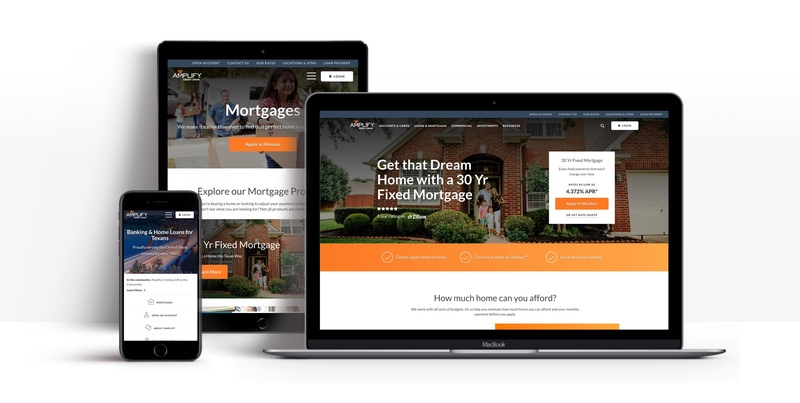 We wanted to ensure that the flow of the new website provided users with a clear path to find Amplify’s products and services. 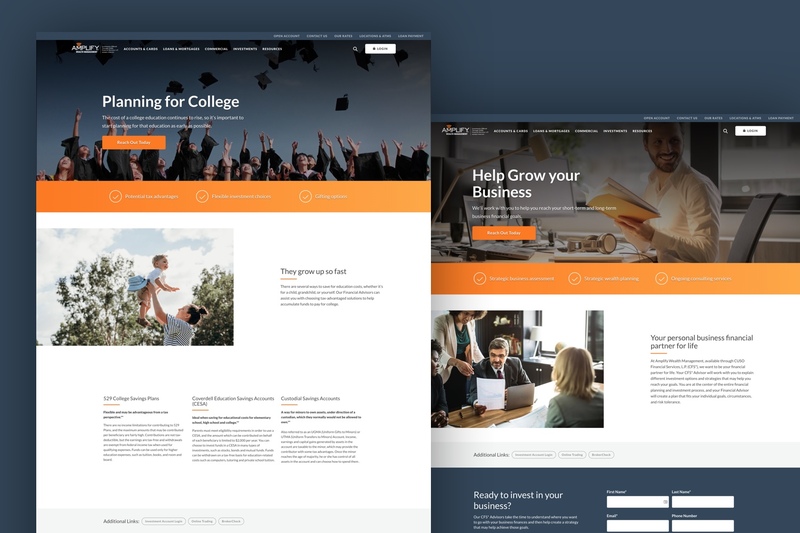 Next, we designed a number of layouts and library of components that would allow the Amplify team to create new pages on their own without additional development work. 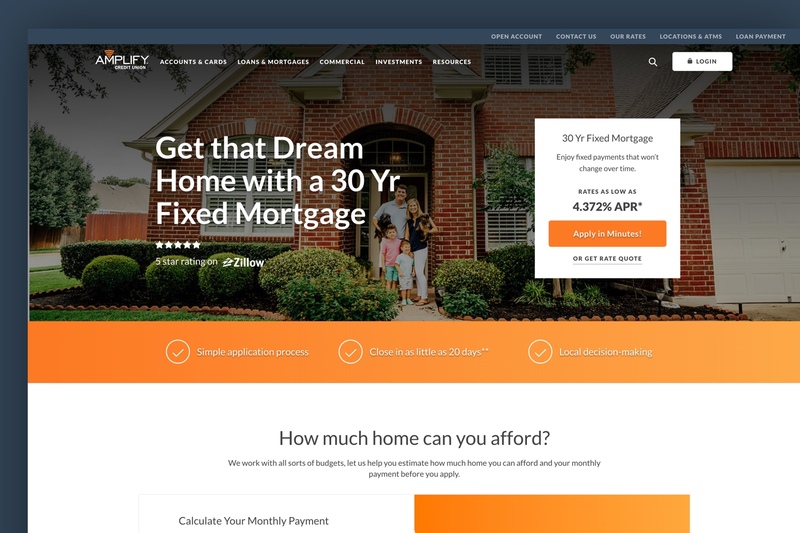 Our visual strategy for the new website was to highlight Amplify’s local presence in Texas. The local feel had to be clean and modern to compliment Amplify’s branches and brand. It was important to give visitors and members the confidence that Amplify is a leading and trustworthy credit union. We thought about ADA compliance and accessibility throughout the project. Our team used several advanced compliance testing tools, including Siteimprove. These tools continuously scan the site for any potential issues. This continuous process ensures that the website is easy for people with disabilities to use and passes compliance testing. 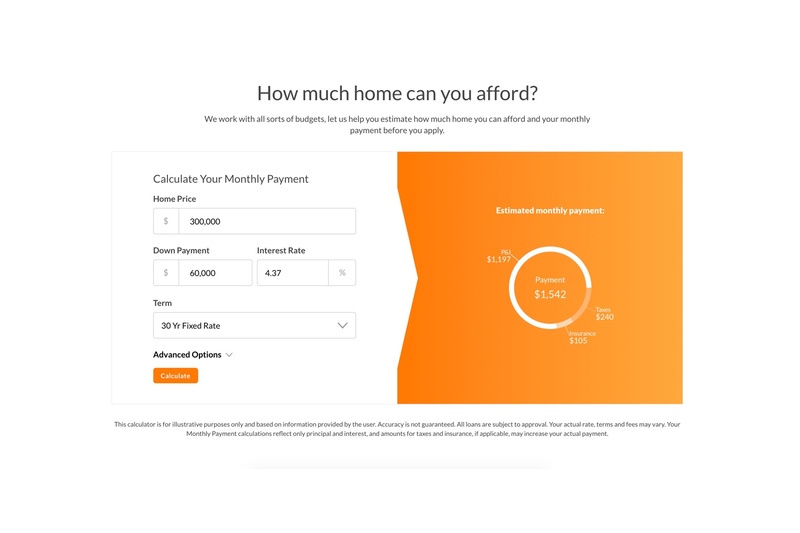 When it came to designing the pages for Amplify’s banking products, we wanted to appeal to new visitors by highlighting key information they would need before opening an account with Amplify. Using a content management system (CMS) gives the client complete control over the content without needing developers to make changes. Using a headless CMS means we have full control over the appearance of the site and can use the most advanced styling and code frameworks. Generating a static site means faster load times and better SEO performance. Using a progressive framework (React Static) means we get the interactivity of a single-page app with the speed and performance of a static site. Heroku’s continuous deployment pipeline allows us to quickly push changes to the code, and we use background processes to automatically update the site whenever new content is published. 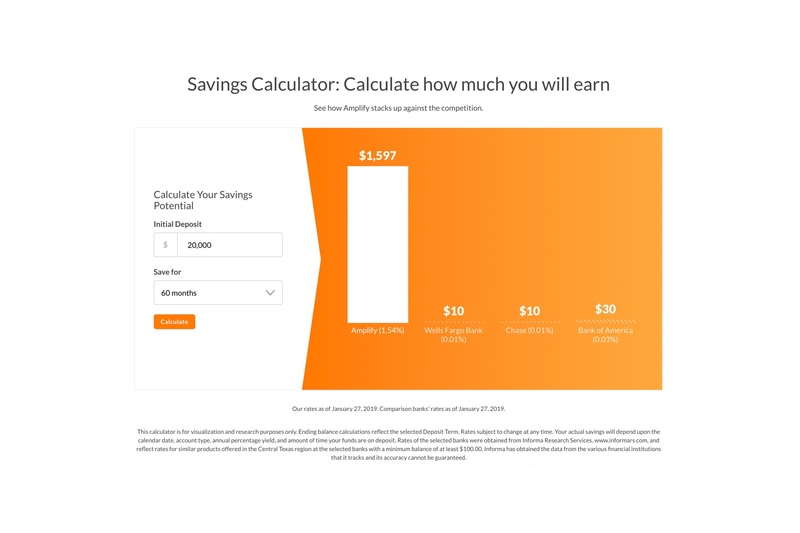 Interactive financial calculators for Amplify’s mortgage and savings products that pulls their rates as well pull rates of competitors to increase user engagement and conversion on the website. We integrated with Salesforce so all the forms submissions throughout the website are sent directly into their Salesforce CRM. Quickly find the content you need that matches your keyword search across the hundreds of pages within the website. Now that the site is launched, we continue to work with Amplify to iterate and continually improve the site.